This one is all about our dogs Say hello to gourmet dog treats that support a fabulous cause and a Pawsome subscription box. We’re thrilled to share this review with you of TWO great companies that are all about our beloved dogs. From yummy gourmet dog treats that support a great cause to a monthly subscription box full of goodies that donates 10% of their proceed to rescues and shelters! Now those are the kinds of companies that we can support while giving our dogs Luna and Little Zeus (LZ) yummy treats and fun toys! Truly Pawsome is inspired by their senior pug, Pork Chop. Wanting to give him the best of everything led them to create specially curated boxes that they think everyone will love. Pork Chop and his little brother Murray are chief taste testers and approve all treats and toys before we send them out.The Truly Pawsome team is also dedicated to making all dogs happy and we pledge to donate 10% of all purchased subscriptions to rescues and shelters as we are want to help all dogs find their forever home. Each box comes with healthy treats, entertaining toys and other handy accessories to keep your pup happy and healthy. There are 4-5 high-quality items in each box per month. 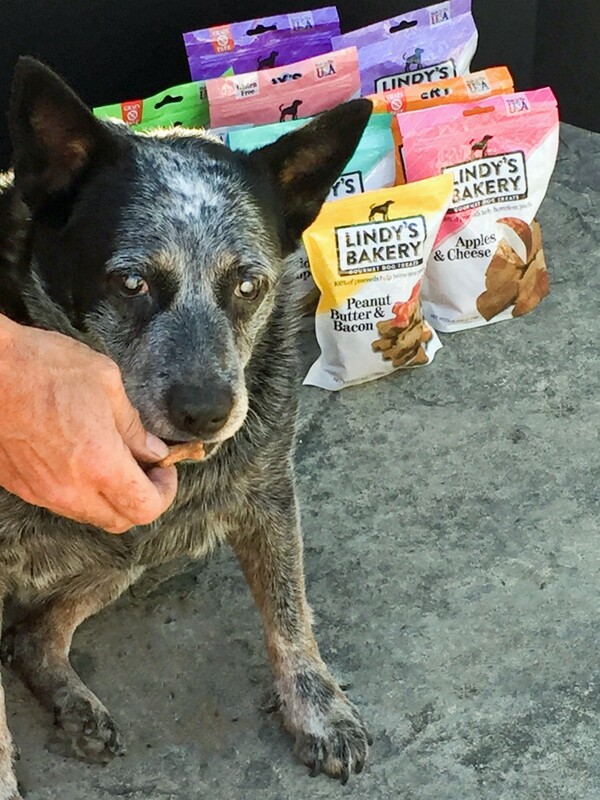 First we’ll sharehow much our dogs Luna and LZ loved the Lindy’s Gourmet Dog Treats. Our girl Luna is not picky and she will eat almost everything, LZ however is another story. He is very finicky when it comes to the crunch treats so we tested them out on him. 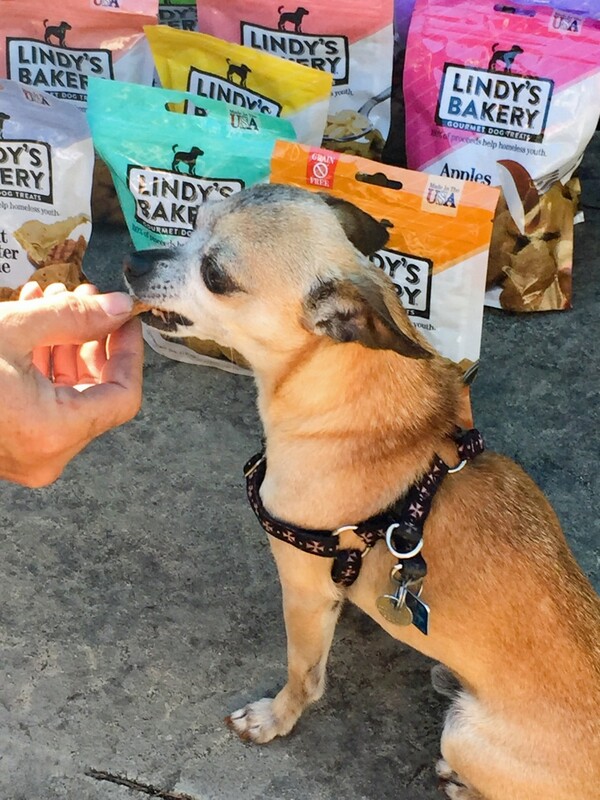 We had high hopes as Lindy’s Gourmet Dog Treats have some very dog appealing flavors like Peanut Butter and Bacon, Pumpkin Pie, Cheese and so many more. Was he really licking his lips for those treats? Oh he sure was and we of course just had to start them off with the Peanut Butter and Bacon ones. LZ did not hesitate at all with these treats. His nose did not turn up when we offered it to them, he just gobbled them up. You can see for yourself below how he’s happily taking a treat. As I mentioned Luna is not picky but that doesn’t mean she likes every treat we give her. However, she practically inhaled the Lindy’s dog treats, seriously she inhaled them. Here she is waiting every so patiently for her treats. She’s such a good girl. As Luna is going blind we hold the treats in front of her so she can decide whether or not she wants to take the treat or not. Well she did not hesitate to take the Lindy’s. She has now tried all of the flavors and doesn’t seem to have a favorite, she just inhales them all. As LZ tends to get spoiled more than enough being the little dog we gave Luna the Truly Pawsome goodies. She does love her toys. It comes in a cute blue box and is nicely presented when you open up the box. I love that cute tissue paper that I totally saved to use for a pet gift for one of our friends. Out of all of the goodies Luna’s favorite is the squeaky Sock Monkey. 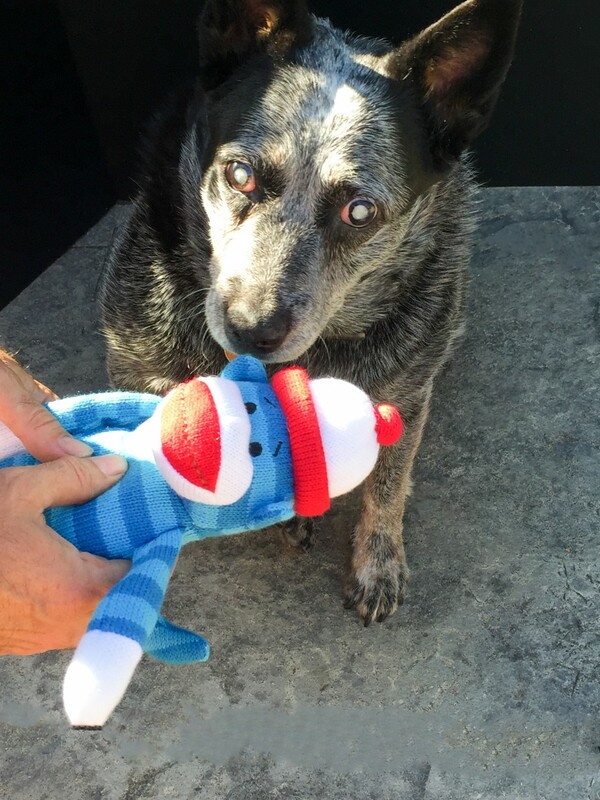 She does love her squeaky toys, especially now that she’s losing her sight we like to to encourage her to use her great hearing even more. Below my hubby is pushing on the squeaker as he presents the Sock Monkey to Luna. She’s giving it a lick so she knows where it’s at. As you can see below Luna quickly made the Sock Monkey her own. It got tossed around and oh the squeaking but it makes her so happy and to us that’s all that matters. 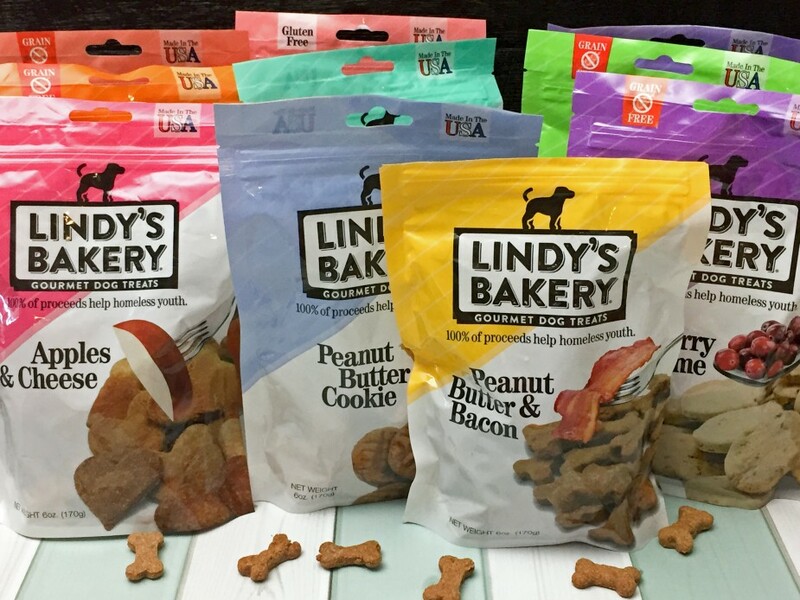 We love that both Lindy’s Gourmet Dog Treats and Truly Pawsome give back to important causes. As mentioned with Lindy’s all of their proceeds go to help homeless youth and Truly Pawsome gives 10% of their proceeds to shelters and rescues. Both causes are close to our heart and we can stand behind companies that give back like that. Luna and LZ give their four paws up for helping kids and animals and because they think those treats are truly pawsome! This is really cool, I love it. What a great big box of goodies and Lindys treats look delicious! I don’t think I have seen them in the pet stores , I don’t have dogs but I do sit for one and everyone in my family has dogs so I always love keeping treats for them, Will look for these.. The flavors look good, too bad they’re for dogs. I have a cat that acts like a dog, but she’s not getting any of these treats. I love to support companies that give back and support their community. Not only do these treats sound terrific and different then other treats on the market, the company sounds top notch too. I love how both companies give back. I have not heard of either before reading this. I will be checking into them for our boys. First and foremost I’m not scared to give these treats to my furbabies and the fact you give back to shelters…WTG! It is awesome that the proceeds are to help homeless youth and sheltered animals. I have rescued 2 dogs from the shelter, a mule and 3 horses. I make sure that all my animals are fixed so we dont have to worry about one more animal being in the shelter. Thank you for everything you are doing to help our youth and animals. I like how the Lindys company helps homeless youth! That’s awesome! I think its.wonderful that the proceeds go to the Homeless youth. My 4 Dogs really enjoy getting treats and love when they get new toys. Thanks for this review. I like that this company helps youth and pets their treats sound fantastic. This is great will have to buy for my girls cant believe all the great flavors pumpkin pie ,apples and cheese, peanut butter and bacon they would love these. Love that 100 percent of profits go to homeless youth! I appreciate the testers, Pork Chop and Murray are real live K9s. And it is nice to hear of companies that give 10% to charities. The review is great! I like that these will be very healthy for my spoiled baby! It will be something I wont feel guilty giving him. I follow Dogmilk.com and LOVED the idea of these super sweet treats for doggies and the community they are coming from. 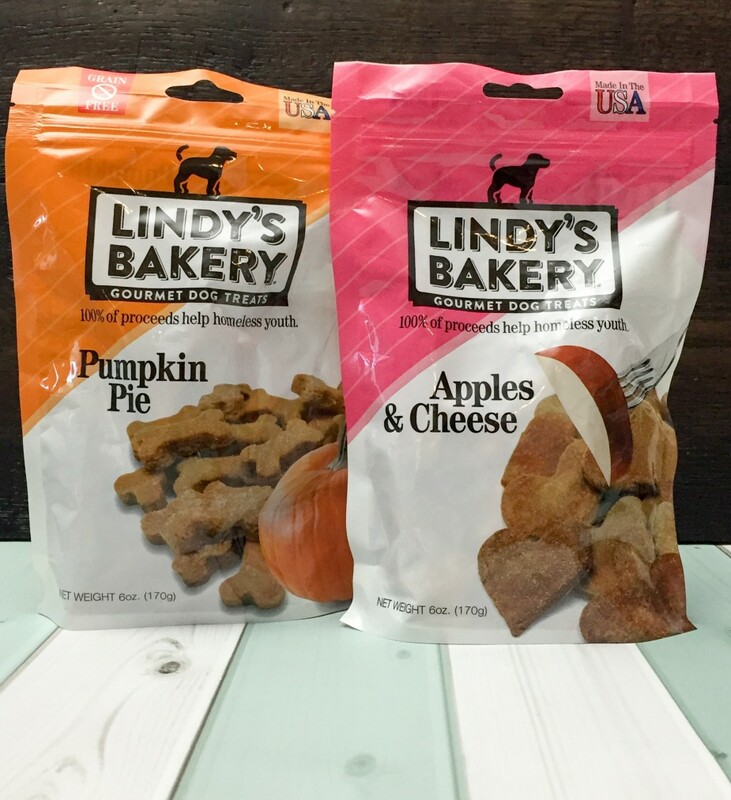 The Lindy & Co treats look super yummy and I can’t wait to have Skye try out a batch of pumpkin!! I love that Lindy’s Bakery is a nonprofit that gives back & the treats look delicious! 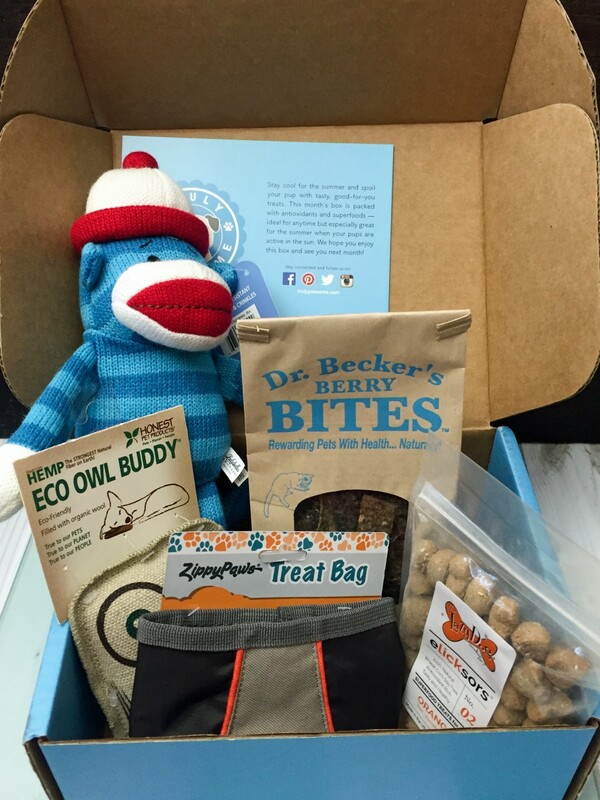 Truly Pawsome Dog Treats & Toys Subscription Box sounds like something my Daughter would love since she is really into subscription boxes and this would be a real treat for her pup. The sock monkey is really cute! I love that they give back also. This is the first I’v e heard of Lindy’s Bakery treats. My daughters’ cat has sensitivity issues and we have started paying more attention to what is in the treats and pet food. I am looking for the perfect treats for our baby girl. She deserves the best. These really sound like they make the cut. I can’t wait to see her face when she tries these. I really like that the Lindy’s Bakery treats come in so many flavors. My pup would love them. That’s awesome that they give back to such great causes. The ingredients of the flavors sound really appealing. I love that sock monkey! It is so cute, of course my dog would just rip it in 5 minutes since she is a chewer 🙂 Those treats looks great too, I have never tried that brand so I will have to keep my eyes out for it! The treats do look yummy, I wish I can eat them! Haha. they definatley represent a great cause and knowing they are from Ohio!!! makes it even better!! What a great company!! So nice to know that Lindy’s was founded in my home state of Ohio to help homeless youths. I also like that 100% of the proceeds go back into the program. The flavors available sound very tempting! Thank you for your review as to how your dogs loved them! 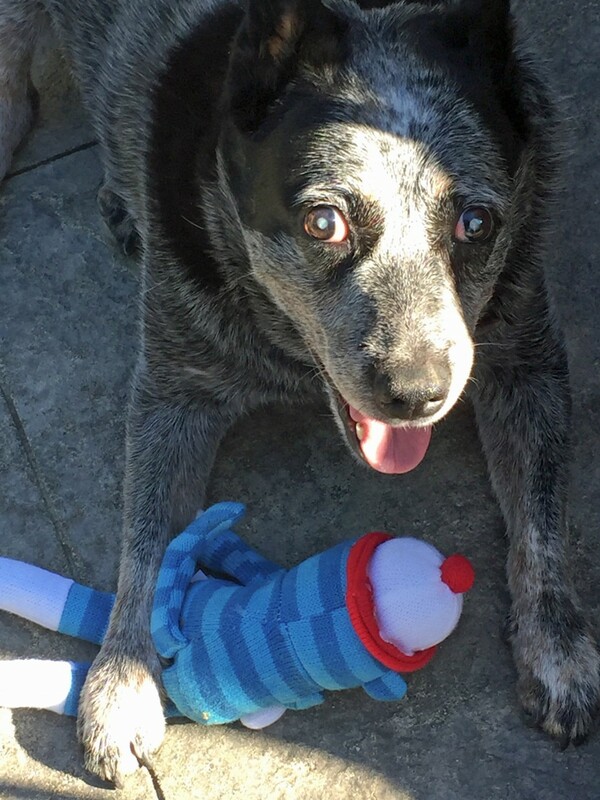 Luna looks so happy with her squeaky sock monkey! One of our two dogs loves squeaky toys, too, and I know what mean about it being worth the squeaking just to see them enjoy their toys. The Lindy’s Bakery treats look great, as well, and I’m sure our guys would scarf them right up. Thanks for the review. My dogs would love the peanut butter bacon treats! What a creative giveaway! 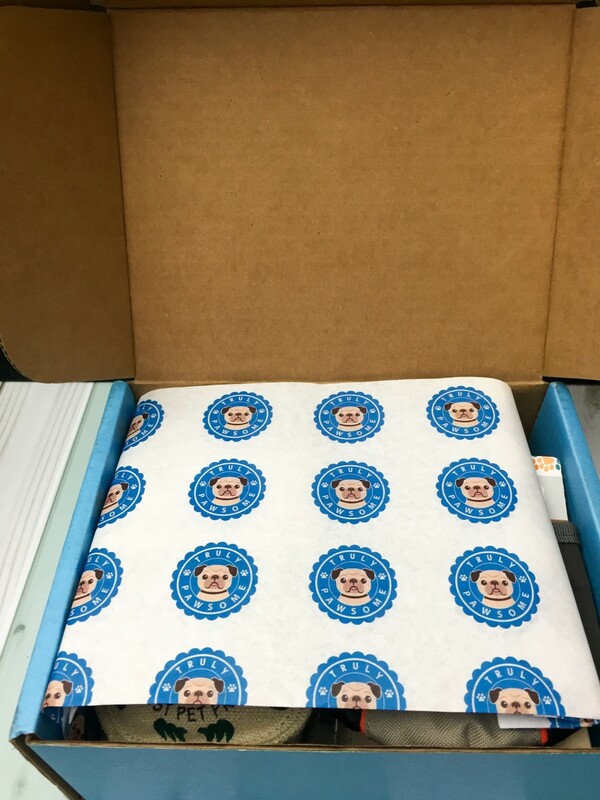 I learned that senior pug, Pork Chop inspired these boxes! I love reading reviews on pet products and these treats look great my 3 rescue dogs would just love to have these to snack on. The box would be a wonderful gift for my friends with pets to give them too. 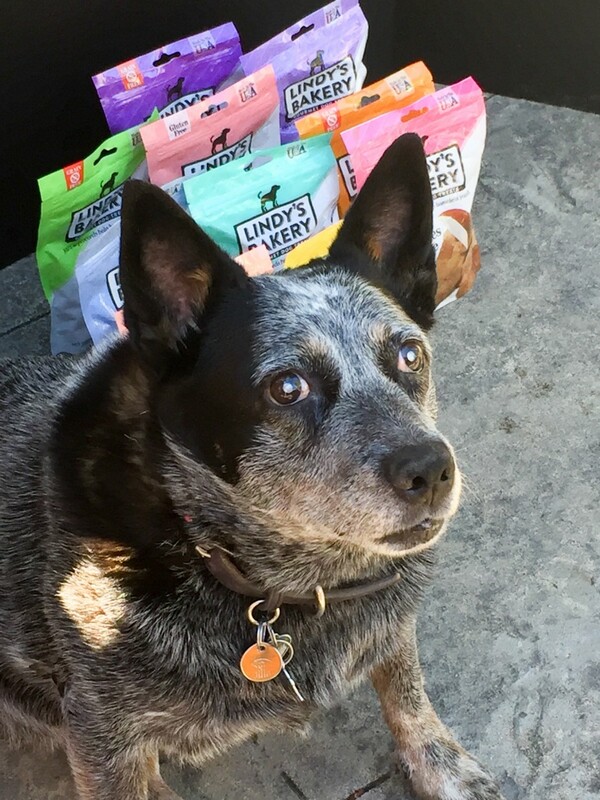 I know that my Ozzy would love all the different flavors they have…and I love that some of their proceeds go to helping those dogs less fortunate than ours! I love that they donate 10% of the proceeds to animal shelters and that they employ and empower homeless youth. I had to read this twice!! What an amazing thing to do for both young people and dogs! Lindy & company is now my favorite home grown company…ever!! What an inspiration to us all…how I love that they are helping those in need and they are learning a true lesson in life! Kudos to everyone!! I like that they are teaching homeless young people skills. Thanks for reviewing this product. That is awesome that they are using proceeds to help homeless youth! Great cause! Amazing company; helping homeless youth and providing healthy foods for pups. I love the review and I really like the gourmet treats and I would like my dog to try one. The sock monkey is so cute! I love that they give homeless youths experience and skills to help them to not homeless adults. just amazing. Peanut butter and bacon treats would spoil my already spoiled dogs! I’m always looking for healthy treats my dogs will love. These sound great. I’ll have to get some for my pack. i like that it was started to give back to shelters and to provide for the homeless in teaching them a trade and giving them a place in the world. i also like that Truly Pawsome gives back to shelters and rescues. i love the sock monkey, very cute. i also like that some of the treats are wheat free, and they have excellent ingredients. lots of different flavors to choose from. Homeless youth are learning work skills helping That is such an awesome pair of companies. Now I really want to try their products! These do like two great companies. My puppy loves trying new treats and Lindy’s sound like they are healthy options. The Pawsome box looks like it would be as much fun for me to open as my dog. My dog Blackie a rescue dog is 12 years old and still love the toys, esp the squeaking ones. the company sounds great because it donates to shelters and rescues. Thanks for sharing. I love the idea that they donate 10% of their proceed to rescues and shelters!–that not only 9is generous on their part but makes me want to investigate their company further to purchase from! How wonderful that this company donates 10% of all purchased subscriptions to rescues and shelters. Too many pets need loving homes. It’s great when folks donate to the cause. I like that these treats have some combination of flavors such as peanut butter and bacon, so dogs get a variety of tastes. I also support those companies that give back to rescue especially since my wife is president of a rescue group. The sound like they would be great for my dog to try. I love the idea they help homeless youth and they help shelters. That says a lot about a company they have a good heart. Small Company Support is so much greater than Big Business!!! Thanks for the chance My Ruger would love this prize packj!! I love supporting companies that give back! My Riot will love these treats! 2 great companies that give back 🙂 I love that!! 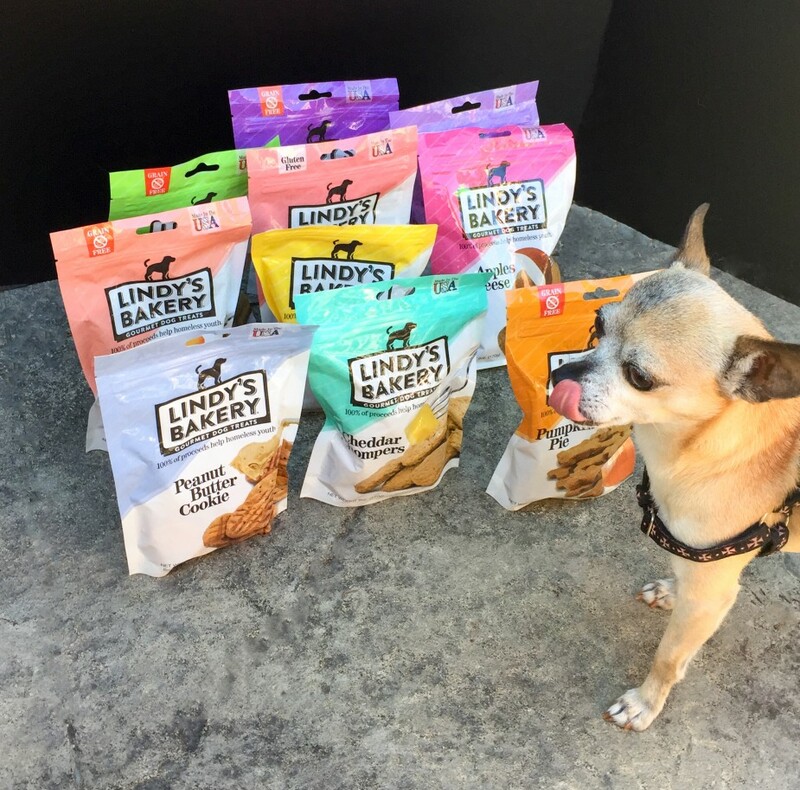 There are so many great flavors to try in the Lindy’s doggy cookies. My dogs would be so happy! 🙂 I know they’d also love to have a subscription box so they could be surprised with new treats and toys to enjoy. It’s good to know that all of the proceeds, from purchases of Lindy & Company gourmet pet treats, goes to homeless youth. And, teaching the homeless youth valuable skills that would be beneficial to them. I like that they are teaching homeless young people a skill so they don’t have to stay homeless. These treats seem like really healthy, delicious treats! I would love to have my dog try them!! Those look like wonderful products. I know that my dog would love the peanut butter and bacon treats. These look like they’re a high quality treat….which is nice. I really like that Pawsome gives 10% of their proceeds to shelters and rescues. I adore companies that give back! The treats have great flavor combinations too! Peanut butter and cheese are my pup’s favorite! I glad to see a variety of flavors of healthy dog treats for picky dogs but love that it gives 20% back to rescues and shelters which is awesome! Oh, I love that sock monkey! /too cute!! I love the flavor variety and the adorable toys! I love what they are doing, teaching a trade & giving back. The presentation box is cute, and yes your doggies looked like they really enjoyed the treats. I know my dogs would approve. They have a lot of flavors. My dogs would go crazy for them. And good for them. I like it that they are giving to shelters and rescues. I love that Lindy’s bakery provides jobs for homeless youth, it’s so important that there are programs like this out there to give them a chance at a future. I love that they donates 10% of their proceed to rescues and shelters. Its good to know that the treats are tasty although all 3 of my dogs would eat anything. Wow. There’s a lot of variety to those dog treats – I know my 7 year old golden would absolutely love them! That stinks that Luna is losing her eye sight – you can kind of tell that she is in the pictures, just the way her eyes are. Hopefully, she’ll be able to rely on her hearing. The squeaky toys really help them with that stuff, even if it does annoy us. lol. Glad to hear that both your dogs liked the treats and the box of goodies! My dog loves treats so I would like to try these. She is so picky. I love the addition of the squeaky toy! I Love a company that takes the time to make a high quality product. The fact that money goes into helping homeless pets is icing on the cake. I learned that they give 10% of their proceeds to rescues and shelters. My two Boston’s love to get stuff in the mail. They have to check out every box, so they would love to get this. Thanks for sharing. What a great idea, love that our dog can receive a package full of goodies via a subscription service. What a great way to make our Thor (our dog) feel special. I love the idea of our sweet dog receiving a package full of goodies via a subscription service. What a great way to help furry friends feel special. We love treating our dogs to special and healthy treats! If they are happy, I am happy! I want them to live long lives. To make that happen it is so important that they have healthy diets. First of all Thank you! for making such good treats for our pets not full of crap. Also how you give 10% to shelters to help other animals in need. I love that you have homeless youth help to learn skills so they can learn and not be homeless cause they are learning a skill how awesome is that! I am really quite impressed with Lindy’s Baker Gourmet Dog Treats. These treats contain ingredients that are healthy and beneficial for my pooch. This company gives back to the community shelters which is so important to me when I buy from a company. Those all sound like flavors the dogs would love…..especially the ones with fruit. I like hearing that they give back to homeless youth and to shelters and rescues. My dog is really a picky eater I think these may be something she might like I need to look for them thanks.